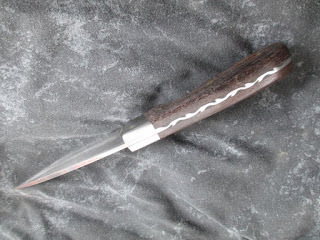 The vine pattern is probably the most common type of file work done on a knife spine. I've outlined the steps below so that most everyone can complete this and move on to more exciting filework. 1). Mark the spine with the marker. Alternate left and right. I used 3/8" (10 mm) spacing. 2). Cut semi-circles on the left side every other mark. 3). Cut semi-circles on the right side, every other mark. These are cut the same depth as the left side, but cuts will be shifted ahead by 3/16" (5 mm). 4). With the narrowest edge of a triangular or half round needle file, cut the 'leaves' about 3/32" (2 mm) above each big half round. 5). Repeat the leaves on the right side. 6). 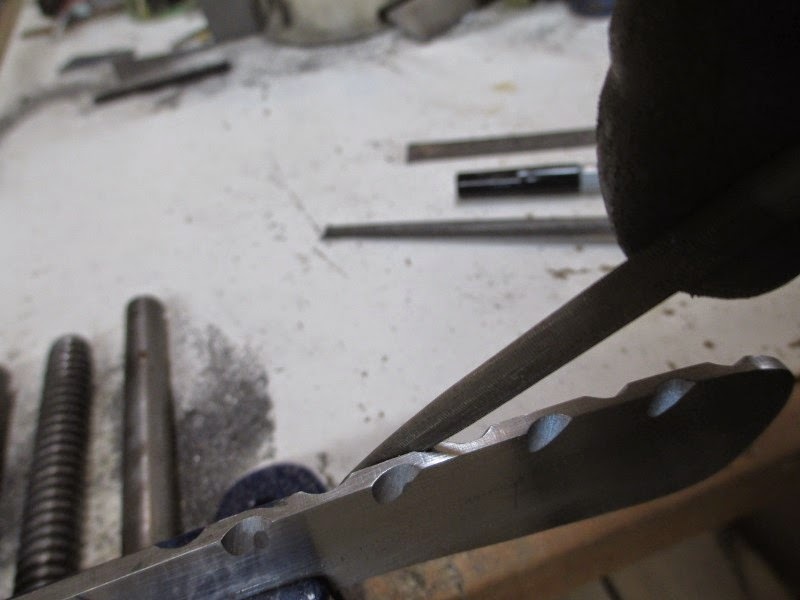 Carefully shape the lower portions of the big half rounds to smooth the vine. Start by securing the knife in a vise and cleaning the spine with some sandpaper. Make a mark every 10 mm (3/8") along the spine. I marked part of a circle alternating left and right on each mark. 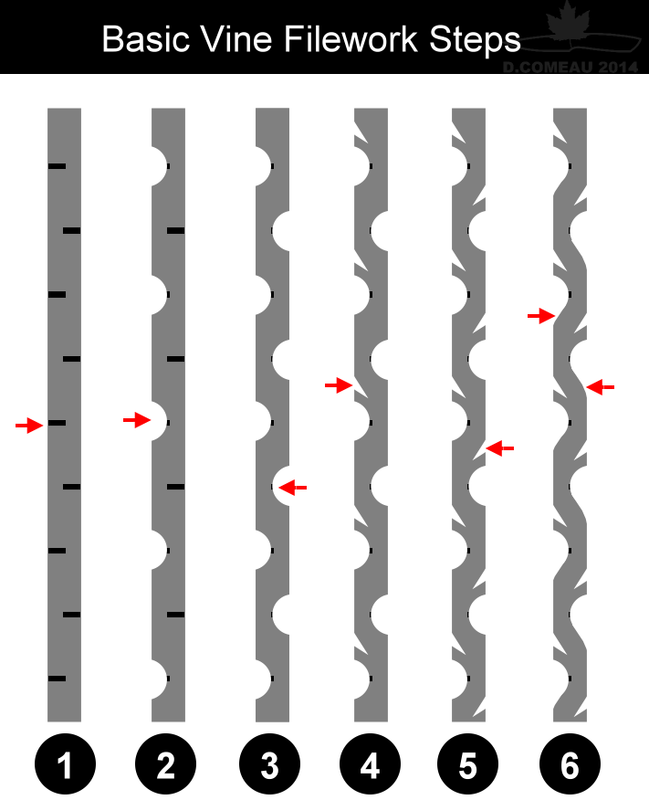 File with the round file and downward strokes holding the file at an angle like shown. Keep the angle consistent and file until the curve is about 1/2 way into the spine. Repeat for right side and left side arcs. Now with the half round needle file cut the leaves. These are about 3/32" to 1/8" above the large half rounds. The strokes are kept as close as you to being 45° forward and on 45° downward. 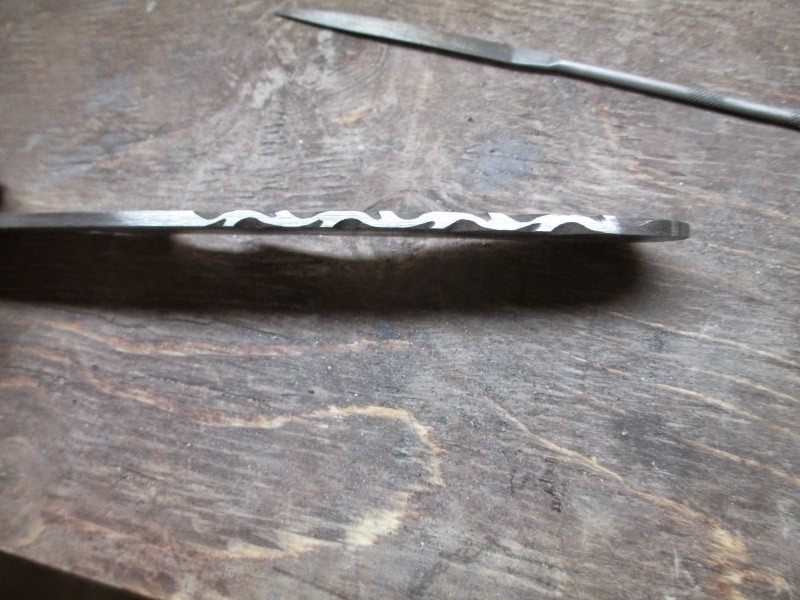 Additional shaping can now be done to give more of a smoother vine effect. A lot of people ask about filling in or not. Or with what? Leaving any openings, cracks, slits or any microscopic hiding places is not good for hygienic reasons. If you want to keep the surfaces smooth and clean, I suggest you fill the depressions in the file pattern with something, say a high performance epoxy like West System's G/flex or Brownell's Acraglas. These have proven to be waterproof and resistant to percussive forces like chopping or dropping. Always prepare the steel surfaces for epoxy by cleaning them with mild abrasive (I like 220 sandpaper) immediately followed by chemical cleaning with acetone or methanol. Do you do this before or after heat treating? How do you smooth it up in there? Finally, do you fill this in with epoxy when putting the scales on? Yes, I do all the filework before heat treatment while the steel is still workable. 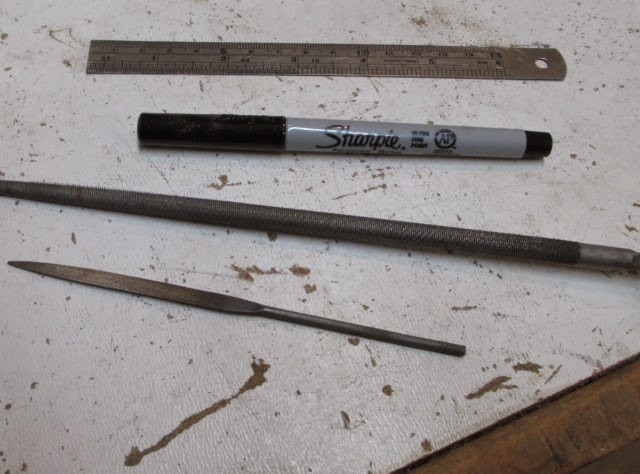 I use a little sandpaper on a wooden dowel and a file to clean the post heat-treat scale before epoxying. I like Acraglas or West System g/flex as they fill really well.